The Catalytic Innovations in African Agriculture Centennial Series was developed as part of The Rockefeller Foundation’s Centennial publications. The Rockefeller Foundation, as an institution with a long history in agricultural innovation, commissioned this series to highlight promising developments in African agriculture, agricultural markets, and value chains on the continent. The projects and programs featured were selected from a review of nearly 150 such initiatives based on criteria that included a focus on smallholder farmers. Read more by clicking on the link below. Chairman and ceo of eleni LLC, Dr. Eleni Gabre-Madhin has been recognized not only worldwide for her vision and leadership in building commodity exchanges to transform lives in frontier economies, but also in her home country, Ethiopia. 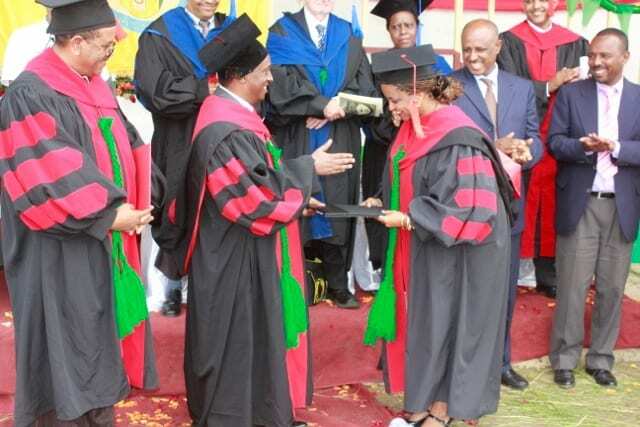 At a gathering of more than 10,000, Dr. Eleni received the degree in the presence of 4,562 graduates and their families in Gondar, a historical town in northern Ethiopia, and called on the graduates to never forget that a committed individual can change the world, to always rely on integrity, and to harness the power of love of self, God, and country as they embarked on their lifelong journey of learning and achievement. Gabre-Madhin rose to prominence a few years ago when she founded and became CEO of the Ethiopia Commodity Exchange (ECX). Since them Gabre-Madhin has become somewhat of an authority on African agriculture, rubbing shoulders with top business leaders and politicians. For example, Gabre-Madhin says that the person who has had the biggest impact on her career in recent years is billionaire mobile telecommunications entrepreneur Mo Ibrahim.